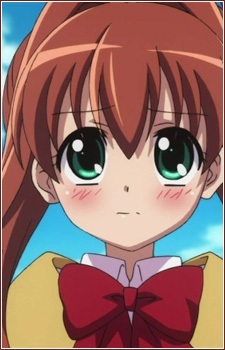 Akari Sakura is the main Heroine of Jewelpet Tinkle and both Ruby and Rabura's human partner. She is a student of the Wiston Educational Institute on Earth as well as the younger sister of Monica Sakura, a famous teen personality and student council president in Middle School. Bright, gentle, shy but can get embarrassed sometimes, she lives with her parents. Her dad is a shipbuilding architect while her Mom is the chief editor at a magazine and because of her older sister's popularity, she developed an inferiority complex and jealousy to her sister. She first met Ruby on the beach when waiting for the bus, at first she thought she couldn't understand her but soon as it progressed, Ruby understood about on how hard her life is and how sad and miserable she is sometimes. She then realized that she was chosen by Ruby to be her partner after a Jewel Charm appeared on her hand. She then entered The Magic Academy afterwards, and became a student along with Ruby. Akari has goals to win the championship with Ruby in the Jewel Star Grand Prix and to earn the Jewel Star. But her wish is somehow undecided as of yet, though she has a lot of competition to top over. Akari can do magic by using her Jewel Charm along with Ruby and Rabura, changing her regular attire to her Pink Magical Costume to increase her magical powers. she always had a crush on yuuma-kun, the star-athlete of her school. and on episode 33, she finally gathered all her courage to confess to yuuma-kun, although his reply has yet been shown.